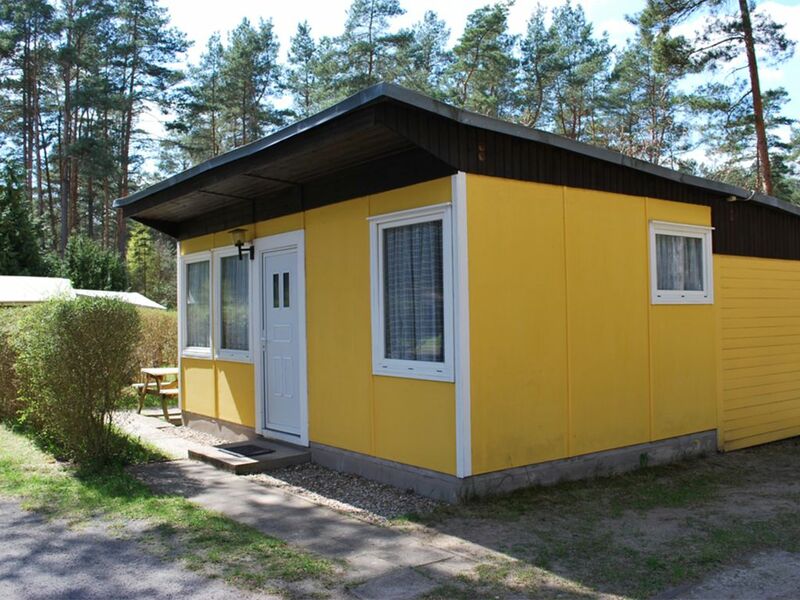 The house is about 42 square meters and can accommodate up to 4 people. It is equipped with a living room with upholstered furniture, flat screen TV, radio and dining area, a separate kitchen with electric stove and oven, microwave, refrigerator with TK-part, div. Kitchen appliances and two separate bedrooms (each with double bed) and a bathroom with shower and toilet. The cottage has central heating and insect screens in front of the windows. The property has a furnished terrace with barbecue. The campsite is located in a quiet location in the middle of a wooded area, only about 500 meters from the lake (Großer Zermittensee). The area covers approximately 3.7 hectares. In addition to caravan and RV sites are on the square and several cottages. On the premises there are sanitary facilities with washing machines, a restaurant, a boat and bicycle rental and a small children's playground. It is also possible to book fishing trips on site. A bread delivery service is also offered. The four different cottages are all in close proximity to each other in the area of ​​the campsite. The exact description of each house can be found in the corresponding object category. Smoking is allowed in all outdoor objects only. For all objects available: WLAN, garaging for bicycles, washing machine (in the washhouse, for a fee), parking. Included in the total price for all houses: water consumption and final cleaning. Bed linen and towels are please bring your own. To be paid on site: Energy according to consumption., Tourist tax, Pet fee (if applicable). Pets: In this object the travel of a pet is allowed (2 EUR / Ü + 10 EUR one-time cleaning fee.). Several animals require the owner's consent before booking. The pet must be registered with the booking. If an entry note is not possible, a late registration must be made. Kagar is a beautifully situated village in a beautiful wooded and natural environment, about 11 km from Rheinsberg. In the immediate vicinity there are several fishing and swimming lakes, which are all interconnected and offer especially good conditions for water walkers. Furthermore, nature lovers looking for peace, who enjoy cycling, hiking, picking mushrooms and watching wildlife, are just right here. Gastronomy and shopping in town.